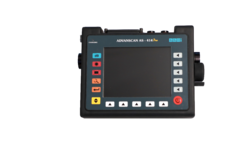 Providing you the best range of ultrasonic testing machine, ultrasonic crack detector, digital crack detector, portable digital ultrasonic machine, ndt equipment and non destructive testing machine with effective & timely delivery. 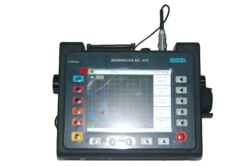 Ultrasonic Testing Machine Advanscan AS-414 combines Electronic & Engineering Co. (I) Pvt. Ltd (EECI) years of expertise and commitment to customers to supply the simplest Flaw Detector in its class by means of most advanced technology, convenience, uniqueness, affordability & technical choices for ultrasonic applications within the market. Tough, light weight & durable industrial grade engineering plastic body. The New Generation Portable Ultrasonic Crack Detector Digiscan DS-324 combines EECI’s years of experience & commitment to customers, to provide the best crack detector in its category. 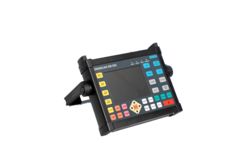 The TFT colored display makes the A-scan representation stable and clear in all types of lighting condition. The rugged, lightweight & ergonomical design enables the operator to use Digiscan DS-324 Portable Ultrasonic Flaw Detector in any environmental conditions. The Digiscan DS-324, Portable Ultrasonic Crack Detector is equipped with LCD (320 x 240 pixels) display, providing excellent A-Scan representation and readability of minute signal. The display also incorporates 4 color schemes & grids/ graticule pattern to suit all type of individual operator levels/ preference. Zoom function makes each and every minute echoes visible to the user. The EECI's Digiscan DS-324, manufactured in India, has a unique inbuilt technology with Flaw Sizing Universal DGS, Highest Reserved Gain Flaw Detector in its category of equipment, improved S:N ratio with advance hardware, user friendly interactive architecture, direct data transfer through pen drive, A-Scan recording, simplified, easy to access navigation key, tough, light weight & durable industrial grade body, large, bright, crystal clear CRT grade display, standard/ dynamic DAC for flaw sizing, li-ion battery. 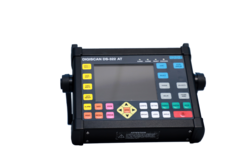 Digital Crack Detector Model Digiscan DS-322 are built tough and is easy to use. 'EECI Make' manufactured in India, Digital Crack Detector Model Digiscan DS-322 is equipped with full size keyboard, ensures direct access to all the functions. The large, high-resolution of Digiscan DS 322, Digital Ultrasonic Crack Detector display has a wide viewing angle and good visibility in any light conditions. DigiScan DS322 fast update rate, high speed digitizer and high PRF ensure you do not miss any echoes even during fast scanning speeds near analogue feel. Digiscan DS-322 Digital Crack Detector uses sophisticated manufacturing technology with the latest new generation components. It is housed in an exceedingly powerful tough metal housing designed for industrial grade instruments. Features of Portable Digital Crack Detector Model Digiscan DS-322 incorporates On Screen Measurement of Amplitude, Parameter Value Read-Out, Echo Measurement, Through Coating Thickness Measurement, Dataset Memory, Direct Report Printout, PC Connectivity through Eecowin Software, Dual Gates, 0.1db Gain Step, Active Freeze, Filled/ Unfilled Display. 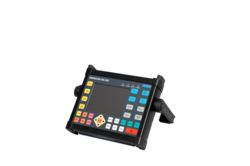 Special features of Digital Crack Detector Model Digiscan DS-322 are DGS Software, Smooth DAC Curve, Multi DAC Curves with freely selected gain values, selection of background and trace color. Portable Digital Ultrasonic Machine Model Digiscan DS322 are engineered powerful and is simple to use. 'EECI Make' manufactured in india, Portable Digital Ultrasonic Machine Model Digiscan DS-322 is provided with full size keyboard, ensures direct access to all the functions. The large, high-resolution of Digiscan DS 322, Ultrasonic Flaw Detector display a wide viewing angle and smart visibility in any light conditions. DigiScan DS322 quick update rate, high speed analog-to-digital converter and high PRF ensure you don't miss any echoes even during quick scanning speeds close to analogue feel. Digiscan DS-322 Portable Ultrasonic Flaw Detector uses subtle producing technology with the newest new generation elements. it's housed in an extremely powerful tough metal housing designed for industrial grade instruments. Features of Portable Ultrasonic Flaw Detector Model Digiscan DS-322 incorporates On Screen measurement of Amplitude, Parameter Read-Out, Echo measurement, Through Coating Thickness measurement, Dataset Memory, Direct Report printout, computer connectivity through Eecowin software package, Dual Gates, 0.1db Gain Step, Active Freeze, Filled/ empty display. Electronic & Engineering Co. (I) Pvt. Ltd. (EECI) is well known for manufacturing Equipments using Non Destructive Technology i.e. NDT Equipments. EECI offers various NDT Equipments using different technology may it be Ultrasonic, Magnetic, Radiography or Eddy Current. NDT Equipments offered by EECI has the latest technology inbuilt ensuring the best results with a good long life. EECI offers a wide range of NDT Equipments for various industries like Railways, Steels Plants, Automobile Industry, Shipping / Aircraft Industries, etc. 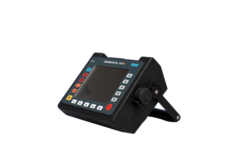 These Non Destructive Testing Machines are useful to different industries like Steel Plants, Shipping Companies, Aircraft Industries, Automobile Industries, Railways, etc. Crack Detector Advanscan AS-414 Pro is New Generation user friendly, easy to use crack detector machine. Crack Detector Advanscan AS-414 Pro has a user friendly setup for single pair Time of Flight Diffraction, easy PCS Calibration & can acquire Gray Scale Imaging Data through Pro-Win Software. 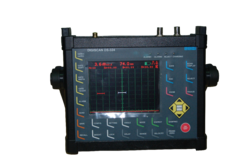 Portable Ultrasonic Testing Equipment Digiscan DS-322 are built tough but easy to use. 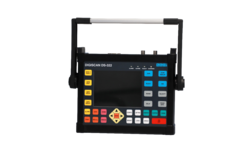 Portable Ultrasonic Testing Equipment Digiscan DS-322 is manufactured using sophisticated technology with latest components. Portable Ultrasonic Testing Equipment is housed in a tough metal housing designed for industrial grade Instruments. 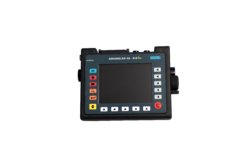 Ultrasonic Testing Equipments are used for NDT testing. These Ultrasonic Testing Equipments are utilized to detect the flaws through Ultrasonic medium. Electronic & Engineering Co. (I) Pvt. Ltd. (EECI) offer various types of machines utilizing Ultrasonic as a medium. These Ultrasonic Testing Equipments are used by various industries like Steel Plants, Shipping Industry, Aircraft Industries, Railways, Automobiles, etc. Portable Flaw Detector (Advanscan AS-414) has a user friendly interactive architecture. Advanscan AS-414 Portable flaw detector is backed with Electronic & Engineering Co. (I) Pvt. Ltd. (EECI) years of expertise. Portable Flaw Detector Advancscan AS-414 is an easy to operate machine. The New Generation, Portable Ultrasonic Flaw Detector Advanscan AS-414 incorporates the most recent and most advanced Hardware & code in its distinctive friendly Interactive design.